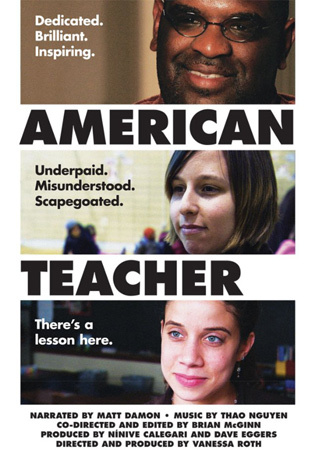 American Teacher, a new documentary film produced by 826 National co-founders Nínive Calegari and Dave Eggers and directed by Academy Award-winner Vanessa Roth, is hitting theaters this fall. Please join us on Friday, October 7, as we celebrate this great new film with stars Jonathan Dearman and Greg Peters, as well as three of the four filmmakers—Nínive Calegari, Dave Eggers, and Brian McGinn. Tickets to the 6:30 PM screening will also admit you to an after-party at Skylark, where filmmakers, film stars, and all the guests will enjoy conversation, drinks, and tacos from 8:30 to 10:30 PM. Additional screenings will be held in San Francisco between October 7 and 13 at 6:30 and 8:45 PM twice-daily, with additional weekend screenings at 3:00 and 4:45 PM. Buy your tickets today! There will also be a screening in San Rafael, California at the Smith Rafael Film Center on Tuesday October 4. Nínive Calegari and Mark Phillips will be there to talk about the film! Buy your tickets for this screening.